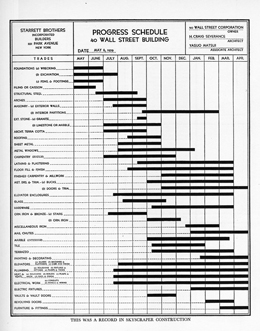 Page reproduction from the Starrett Job Book, Gift of HRH Construction. Detail of above page reproduction from the Starrett Job Book, Gift of HRH Construction. "Of all the construction work I have handled, the Bank of Manhattan was the most complicated and the most difficult, and I regard it as the most successful." So wrote the builder�Paul Starrett in his 1938 autobiography Changing the Skyline. 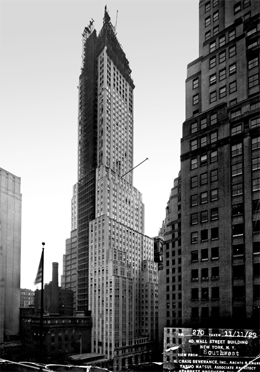 In May 1929, just a few months before they received the commission to erect the Empire State Building, Starrett Brothers & Eken constructed the 70-story�Bank of Manhattan tower with astonishing speed: demolition and erection was completed in just 12 months. "The existing buildings were of heavy masonry, with foundation walls five feet thick, in some cases, and very difficult to remove. Obviously, we could not complete on time if we waited on the wrecking. We decided, therefore, to install our caissons under the old buildings, using them to brace and hold our work and to act as a weight against which we could use our jacks. Here the wrecking above was carried on simultaneously with the foundation work below. 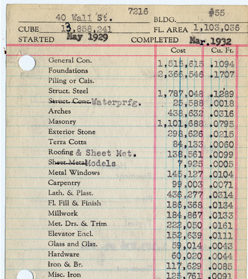 With three shifts of men working seven days a week, we were able to put tenants in the new offices on May 1, 1930. Our operations were not made easier by the narrow and congested streets, with complete lack of storage space outside the building line. We had to make the most careful plans for delivery and distribution of materials... I had subsequently to answer criticism that we wasted money to save time; our entire expense in overtime was less than one month's gross revenue of the new building, and we saved several months." 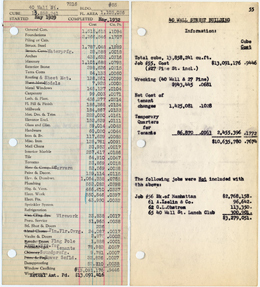 Shown above and in the case opposite are the original Starrett job book and reproduced pages recording precise prices of all the materials used at 40 Wall and 63 Wall. Total cost for the 40 Wall construction was $13,091,416 or .9446 dollars per cubic foot. 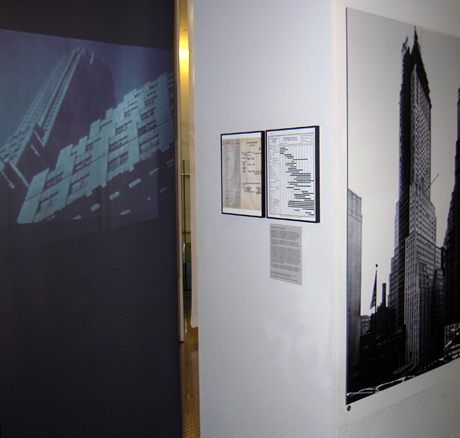 Back of case: Construction progress photograph of 40 Wall Street, 11/11/1929. Original, gift of Judith Stonehill, New York Bound Archives. Filmed just before the South Ferry - Chatham Square (near the NY County Courthouse) section of the El was closed in 1950, the film records the tight squeeze as the rail lines snake through the office buildings of the financial district. As the train pulls away from the Fulton Street station, the view south shows the white setbacks of the 120 Wall building in the background as the train makes the journey up Pearl Street to the Bowery.